Meriel joined the school in August 2017 having spent 20 years working in the theatre industry as a scenic artist, prop maker and designer. She holds a Theatre Design BA from Nottingham Trent University and recently completed a PGCE (Rose Bruford College). 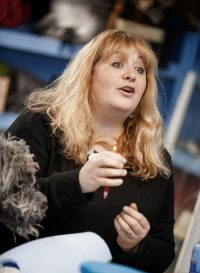 Meriel served for 14 years at the Royal Exchange Theatre in Manchester, creating sets and props for over 140 productions. She has also worked at the Royal Lyceum in Edinburgh, Oldham Coliseum, Bolton Octagon and Manchester International Festival as well as on TV shows including Life on Mars (BBC) and Rovers (SKY TV). Meriel covers the disciplines of props and carpentry for the Production Arts course. She is passionate about creative education and believes in the power of ‘learning by doing’.